Richard Butler was an important Colonel in the American Revolutionary War. Butler’s most important role was his negotiations with the Native American nations of Upstate New York and the Ohio River Valley. By the outbreak of the American Revolutionary War, the Butler family immigrated from Ireland to Pennsylvania. Thomas, patriarch of the clan, opened a rifle shop which his sons all grew up working in. This shop (which still operates) was frequented by a young Daniel Morgan. Two of the five brothers, Richard and William, became successful fur traders based out of Fort Pitt. When the war came, all five signed up to serve their country. Early on in the hostilities, Richard Butler was selected by the Continental Congress to meet with Native Americans in the Ohio River Valley and negotiate their cooperation in the war. Upon his returned, Richard was commissioned as an officer in the Continental Army. His first post was serving as number two to his old friend Morgan. Butler quickly rose through the ranks, achieving the rank of Colonel by 1777. Throughout the Revolution, he participated in most of the notable engagements including the Battles of Saratoga and Monmouth. Lord Cornwallis and the Marquis de Lafayette had been playing a game of tag with their armies for weeks. They came close to fighting but no attacks were made. Butler was sent to engage a segment of the British Army in eastern Virginia. This ended up being a brief, inconsequential skirmish which resolved quickly as both sides seemed to fear the other would be reinforced at any moment. Ten months later, Richard Butler was with the Continental Army for the Victory at Yorktown. Butler and his brothers were toasted by General Washington himself at the celebratory dinner. In reverence to his esteemed service, Richard was given an honorary appointment of Brigadier General in the last days of the Continental Army. Butler was soon after asked to put his knowledge of the Native Americans to good use. He was sent to Upstate New York where he signed the Treaty of Fort Stanwix of 1784. The Treaty of Fort Stanwix ceded certain lands to the United States, however, said lands were occupied by different tribes than those who signed the contract. This led to quarrels with Native Americans of the Ohio Valley. Butler held several more meeting with the Native Americans to resolve the issues created at Fort Stanwix. Eventually, he helped create the Treaty of Fort McIntosh. This assisted in giving Pennsylvania the shape it has today. Not all had been resolved, however, and the Northwest Indian War broke out. This oft-unremembered war was fought between the United States and the Native Americans living in the Northwest Territory, which had been won from Britain in the Revolution. Richard Butler was named a Major General in the Continental Army and went to fight in Ohio. Butler was one of three men in charge during the Battle of the Wabash. Also known as St. Clair’s Defeat, this was one of the most shocking losses in the young nation’s history. Almost ALL of the one thousand Americans involved in the engagement were wounded in some fashion. Richard Butler was one of those wounded. He died, and was buried, on the battlefield. To read about other Founders who died shortly after the Revolution, check our article on John Laurens or learn 5 strange facts about Benjamin Franklin. 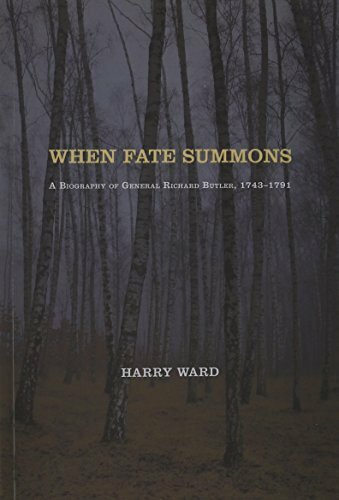 If you would like to read more about Richard Butler, pick up a copy of ‘When Fate Summons’ from the library or through our Amazon affiliate link below. If you would like to learn about a different Founder every day, make sure you subscribe to our email list.